Page 1 of [VIDEO] The future of helicopters? [VIDEO] The future of helicopters? Helicopters are expensive and rather unstable, very unsafe in out of control situations, and not that easy to fly. Having been in a few helicopters here and in Oz, it is a rather hair raising experience, as a passenger. This could be the future though, 'The surefly', a drone style helicopter that is less unstable, and has battery backup to get down if the petrol engine fails, It also has a drop parachute if all else fails. Price will be around $200k which is in reach of business executives, air pilots, Oz outback pilots, rich private flyers. Range is limited at present , but will get better with larger sized craft. They envisage a bigger craft, more powerful engine, to be used for air ambulance use, etc. RE: [VIDEO] The future of helicopters? I know they said 20 to 70 km range initially but no mention of engine failure over water. I'd imagine island hopping would be a fairly large market. Looks a fun toy though if I had 200 grand spare. "but no mention of engine failure over water"
But then I guess engine failure over water isn't specific to this kind of vehicle. If it's coming down soft it needs to float not sink. Going back to my north sea training for helicopter travel, it was get doors open before ditching, wait till helicopter rollsover and blades stop rotating and orient yourself (Yeh, right, if possible) and head for the surface. 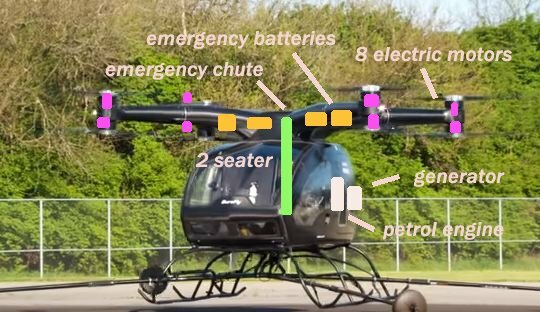 Not sure how this drone style helicopter would sink, roll, time for blades to stop, etc, compared to a normal helicopter, but would assume the FAA would definitely ask those sort of questions and maybe ask for a dunk test. I've always wanted to go for a ride in a helicopter, but never had the opportunity. And the weird thing is, I'm scared of heights. But flying has never bothered me, but I could never climb up a 40 foot ladder. Bandi, did you work on an oil rig? I've always been interested in the process of offshore drilling, it seems such a difficult engineering challenge it's hard to believe it was financially viable, but it must have been because they wouldn't have done it if it wasn't. Pat says....Bandi, did you work on an oil rig?Not so much work on an oilrig for weeks, but I was a trouble shooter for a while where you went out to the rig for a few days at a time, but still had to do a weeks safety training including mockup helicopter ditching in a pool. My trouble shooting was for example, where you went out to a rig to solve an expensive electrical/mechanical fault, like snow doors sporadically jambing up. Doors that protected the exhaust and air supply hoods of a gas turbine for supplying electric to the rig. Great money while it lasted and good steaks on board. But rather dangerous. The work not the steaks LOL. [VIDEO] RE:The future of helicopters?